This week on The Bugcast: Spectrum designer dies, crowdfunder smashed, new mixer (for food, not sound), plus we play 8 amazing tracks of Creative Commons music from The Rinn, Martinez, StoneNipples, Liam Stewart, Saint Anyway, Loudog, Amity In Fame, and IntoXication. This week on The Bugcast: in our fourth celebratory special, Caroline and Dave host a selection of our listeners’ favourite tracks from the past year, featuring 10 brilliant tracks of Creative Commons and independent music from Aviator Shades, Kill Matilda, Jana Fisher, Boogie Belgique, Stephen Keaney, Jonathan Relf – The Bugcast vs. Grapes, Talking To Sophie, Neon NiteClub, Somewhere in Time, and StoneNipples. 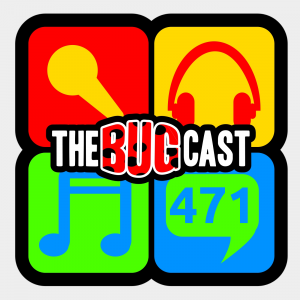 This week on The Bugcast: a tribute to a musical legend, domestic updates, and Podcrawls, plus our usual selection of 8 amazing tracks of Creative Commons music from Kellee Maize, The Happy Somethings, Lawrence Beamen, StoneNipples, B L O E M E N, Havy n Hope, Babypaul, and Scream Inc… plus a bonus track from Linkin Park. This week on The Bugcast: disAssociation, Children, health hacks, and Eurovision, plus 8 amazing tracks of Creative Commons music from Cockroaches, Pixelplants, Stonyroad, Jemma, Gypsy, The Glass Child, The Vow, and StoneNipples.